By far one of my favorite Disney movies to come out in the last few years is Ratatouille. This adorable film features Remy, a rat with a refined palate and a love for French cooking. It’s a really sweet story of someone pursuing their passion, even if the people around them think it’s not possible… Also it’s about food, which is always a plus for me. Remy teams up with a human lacking cooking skills, Linguini, and lets him take credit for his delicious creations in a popular French restaurant. When a notorious food critic comes to town, it’s up to Remy and Linguini to team up and impress him. Their recipe of choice is ratatouille. I used this recipe as inspiration for my ratatouille. The only changes were that I subbed basil for the rosemary and left out the eggplant. I tried my hardest to make it neat looking like the movie’s version, but obviously my veggie stacking skills lack in comparison to Remy’s. I served it over steamed brown rice and it was delicious! I’ll have this recipe in my back pocket as a way to use up the overabundance of zucchini and yellow squash that seem to flood the farmer’s markets each summer. PS, did you know the film came out more than 7 years ago? Isn’t that ridiculous! 7 years?! Good grief, time flies. I only saw it about 3 years ago on DVD though, so maybe that has skewed my perception of its release. Nothing is weirder though than thinking that Lion King came out 20 years ago. 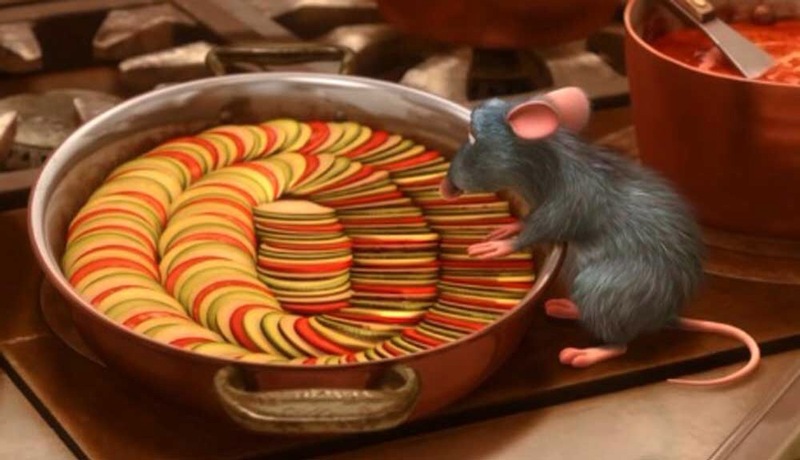 I love your theme and your ratatouille looks delish! Thank you! This was the perfect theme, since I’ll take any excuse to talk about Disney. Pretty! 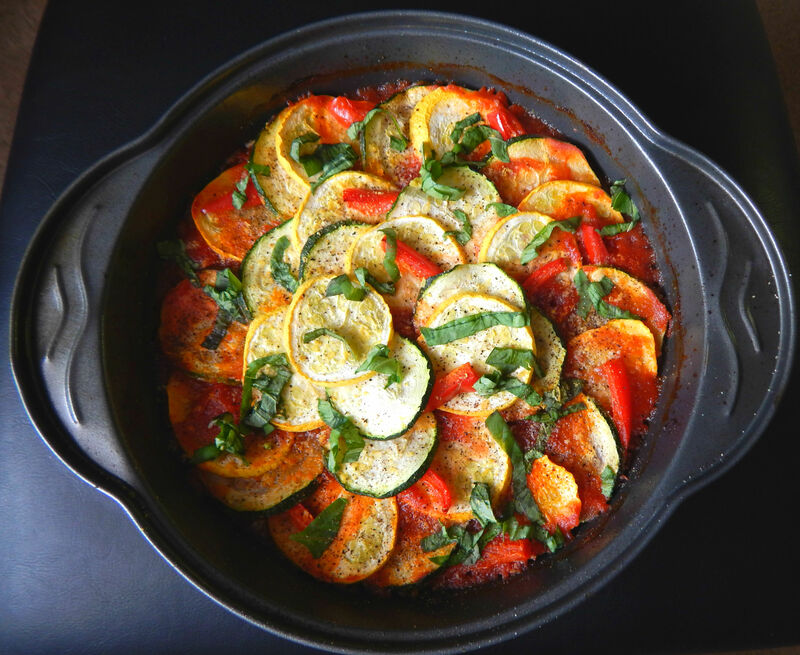 I’ve never done ratatouille with slices, always chunks, but yours looks really lovely! Chunks would probably be easier, since my mandolin has gone missing. Only about half of my slices turned out nice and consistent, the rejects were hidden away in a veggie stir-fry for dinner. Looks beautiful to me! I haven’t made ratatouille yet this season, which really is amazing since… You know…. Summer. Also one of my fave movies.